Grape harvest season for the AOC Alsace appellation was officially launched on the 24th of September and officially ended (where I work) on the 29th of October. Grape-pickers w ere nostalgic about the exceptionally short and early grape harvest from 2011 which officially started on the 12th of September and finished about 4 weeks later. They were also longing for the hot and sunny weather which made their everyday life. But again, that was an exception. As I’ve been told, 2012 was more typical and was described as a grape harvest season that winegrowers used to have 20 years ago in Alsace. Concretely, it means that winegrowers faced difficult conditions and difficult decisions had to be made. – There were many rainy days starting from the 24th of September. Problem: On top of having unhappy grape-pickers harvesting under the rain, it’s advisable not to harvest with this type of weather since you’ll not only bring grapes but also water in your harvest bin which will dilute the amount of potential alcohol contained in the grapes. – Because of the overall weather during the summer, grapes had difficulties to reach the necessary maturity to make wines with 12% alcohol or more. Fact: 17 g of sugar/ litre of must produces 1% alcohol. Problem: You need to have at least 204 g of sugar/ litre to produce 12% alcohol and this sugar is actually contained in the matured grapes. So if the grapes have not reached the level of sugar wanted by the winemaker, all you can do is wait hoping for sunny days that will mature the grapes, because rain will only add water to the grapes and dissolve the sugar. – Grapes started to rot. Fact: Rain isn’t good for the grapes waiting outside to be harvested. As seen in Vintage 2012 in Alsace, humidity favours the development of fungus and at this time of year it’s the grey rot also called botrytis which will spoil our harvest. Problem: The more you wait and the more it rains, the more the grapes will rot outside and make it harder for the winemaker to make quality wines. All in all, it wasn’t an easy period for the Alsatian vineyard but after 6 long weeks we finally made it and it was a great experience. 05 Nov	This entry was published on November 5, 2012 at 10:53 pm. 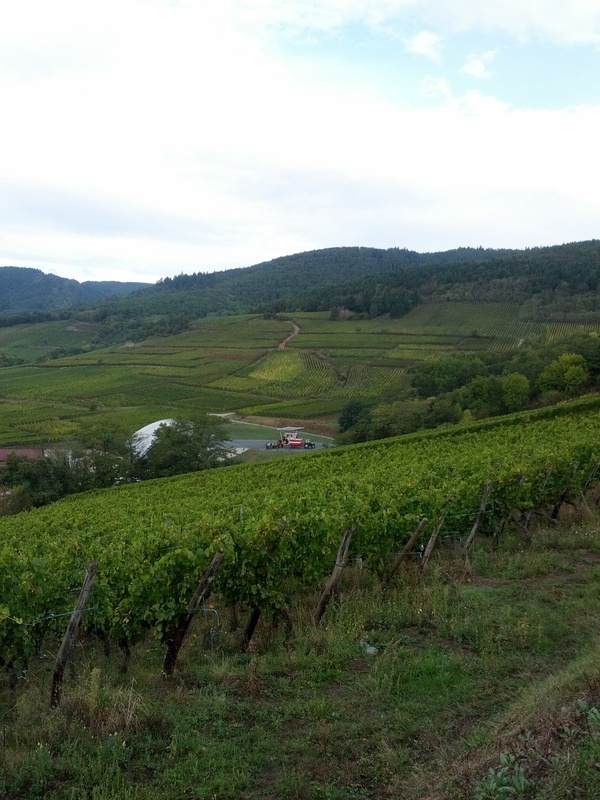 It’s filed under Grapes, Learn More and tagged 2012, alsace, grape harvest. Bookmark the permalink. Follow any comments here with the RSS feed for this post.